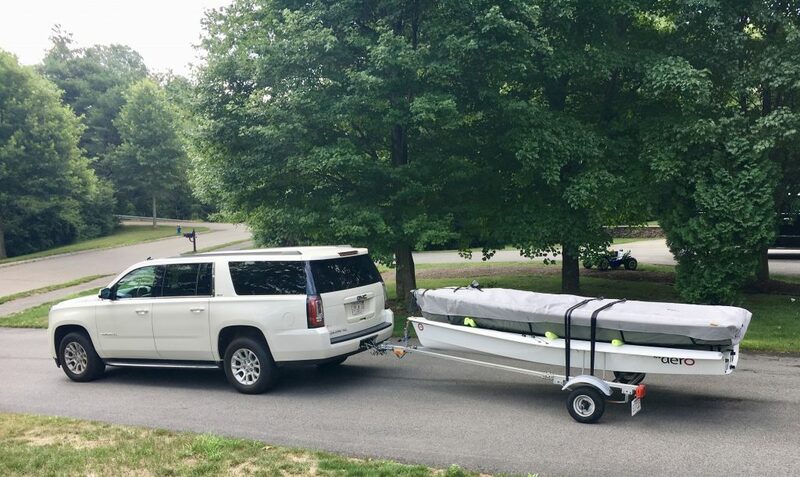 For my 43rd day of RS Aero sailing in 2018, on the last Saturday of July my son and I hit the road to sail in the Red Lobdell Regatta in Stonington, Connecticut. After all the years in the 1980s and 90s when I drove him to Optimist regattas when he was a little kiddo, and then all the years I drove us both to Sunfish and Laser regattas when he was a teenager, for the first time Tillerson offered to drive me to a regatta. He has just acquired one of those monstrous people carriers, the size of a small school bus, that American families with 4+ kids seem to need these days. So I expect he wanted to show me how we could get all of our sailing gear in the extensive interior of this behemoth, and how the 700 (or whatever) horses under the hood could capably tow the massive load of two RS Aeros weighing all of 180 lbs. Yes, dear reader, those are (tasteful lime green) swimming pool noodles between the two RS Aero hulls. In theory, RS Aero hulls are designed to stack but some padding is needed to prevent various protuberances on the deck of the bottom Aero from damaging the hull above it. I had noticed that both RS Aero class manager, Marc Jacobi, and master RS Aero fleet builder, Jim Myers, have lately been using pool noodles as separators between stacked Aero hulls. Who am I to disagree with such experts? So I went off to Ocean State Job Lot to buy me some noodles. Talking of “firsts,” this regatta was the first RS Aero regatta ever in Connecticut. Well, it’s the first Aero regatta in Connecticut I can remember. That’s somewhat surprising given that back in the day (meaning May 2015) when a few of us took delivery of the first RS Aeros in the north-east it was from a Connecticut dealer, Scott Hardy of the Boat Locker – at that time the only RS Sailing dealer in the region I believe. Since then we have sailed a bunch of regattas in Massachusetts and Rhode Island and even New York state, but never before in Connecticut. Weird? Wait, where was I? Where am I? Oh yes this is supposed to be a regatta report. You want to hear about the weather and the sailing and all the brilliant tactical moves I pulled off and my top tips on how to sail fast in 3 knots of breeze. Anyway, talking of “firsts” as we were, this is also the first regatta in New England that I can remember in the last three years when the aforementioned ubiquitous Marc Jacobi was not sailing. Where in the world is Marc Jacobi? How strange. 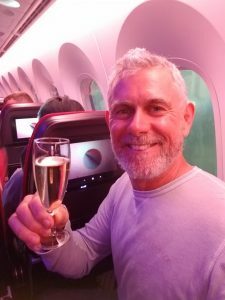 He seems to be on a plane with pink lighting and he is sipping champagne. But Marc doesn’t drink. Can this really be him? And where is he heading? 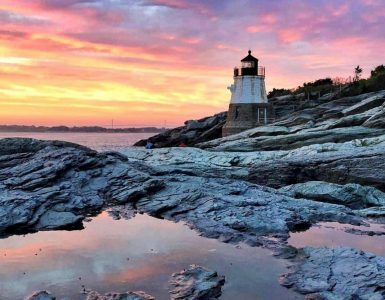 What could be better than sailing in Stonington? Oh dear. I got sidetracked again. You want more details about my brilliant performance in the regatta. Well I was OCS in the first race. (Another “first” for me, I think.) And things went downhill from there. The regatta was won by some ringer sailing an RS Aero for the first time who just happened to be the current North American champion in a certain other single-handed class. Don’t you just hate it when that happens? But he was a super nice guy so we didn’t really mind. Maybe he will buy an RS Aero? But I had my moments. I was first boat to round the windward mark in one race. And I was first boat back to the beach after racing, having discovered a previously unknown fast downwind in light airs mode. Can’t wait to try it out in a real race. The photo at the top of the post shows me in 2507, Tillerson in 1421 and the sailor formerly known as Email Dude in 1422. We are about to round the leeward mark and I am clear ahead!!! O frabjous day!!! Callooh! Callay!!! But seriously, where in the world is Marc Jacobi? Wait, here is another clue. There he is enjoying a cup of tea in what appears to be an English country garden. I wonder if he will get to do a spot of yotting while he is in England? Thank you to my sponsors for my Ocean State Job Lot and Intensity Sails 43rd day of RS Aero sailing in 2018. The 2018 campaign of Team Tillerman would not be possible without their generous support. Your personal regatta outcome? Unimportant. What’s exciting here is the use of swim noodles as hull separators during boat transport. You must dish: did you use the regular diameter (rather small) or the super-sized swim noodles for this task? I wonder if passing dowel rod down the middle of the noodle, as a stiffener, would be a plus or a minus? Any damage to either hull? What kept the noodles from shifting during the drive? Brilliant idea. Curious minds want details. I sometimes use small half sections of swim noodles to pad spars and other boat parts from the gouging of hooks on the ends of bungy cords. In a pinch, I’ve used bits of swim noodle with plastic zip ties to pad out hiking straps. Endlessly useful stuff! Thanks George. I am still working on refining this art form of writing about a regatta without actually mentioning anything about the weather, the sailing, the racing, the competition or the outcome. I think I got the original inspiration for this during the last year I sailed in the UK, 1988. 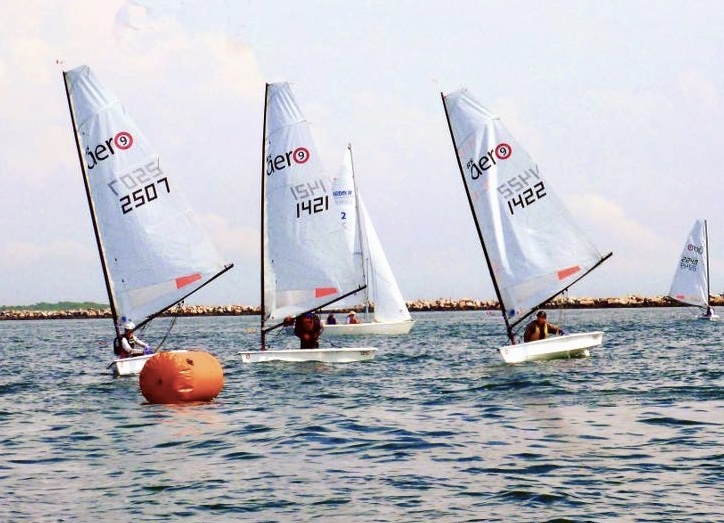 I submitted a conventional regatta report to the Laser Class newsletter. It won second place for best regatta report of the year (or something.) But the winner was a report of only one sentence. Less is more. 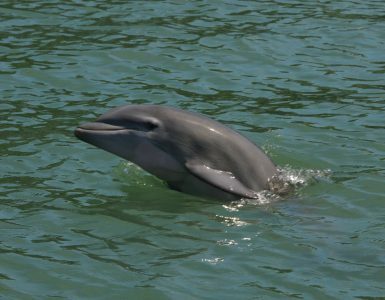 Then when I started blogging in 2005 I admired the work of some of the other “sailing” bloggers. Ant Clay’s reports on the breakfasts at regattas. Sherry Fowler’s brilliant posts about some of the less often covered sailing topics such as blazer buttons and sandpaper. I started to realize that there are more important things in life than sailing… such as bacon sarnies, swim noodles and the number 43. Thanks for supporting my obsession. To answer your questions: 6. Regular. Minus. No. Friction. Looking forward to reading some noodle posts on your blog. I notice that virtually all pool noodles are today made in China. The only logical explanation must be that the Chinese were the first to invent noodles and have had nearly 4000 years to corner the market. The Romans didn’t start making noodles until nearly 2000 years after the Chinese and it’s now nearly impossible to find a Roman pool noodle. I thought roman noodles were made in Japan. I feel it my duty to respond to certain comments/statements made in this blog. 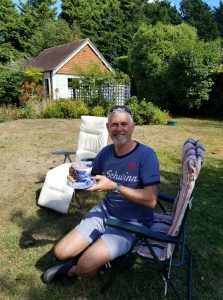 And yes, that is a second picture of me, enjoying proper English tea in the backyard of a quintessential English cottage on a very un-English-ly warm, sunny afternoon. It seems I bring sunshine and warmth wherever I go (and explains the damp, miserable weather New England “enjoyed’ during my absence). Back from my English odyssey (partial details at MarcJacobi.blogspot.com), I look forward to blue skies and fair winds on Lake Massapoag two weeks hence. Apparently Marc did do a spot of yotting while he was in England. I heard he went to some sort of sailing competition in the English south coast resort of Weymouth along with over 200 other people… all sailing RS Aeros. Sounds perfectly awful. I would never go all that way only to risk having to cross the finish line behind over 200 other sailors. Some of them were probably little kids or old geezers even older than me. Anyway, Marc did win a lot of the races there and so he is now an RS Aero World Champion. I think actually he was already an RS Aero World Champion so why he needed to go all the way to England again when he could have been making history by sailing in the FIRST EVER RS AERO REGATTA IN CONNECTICUT I still don’t really understand. Thankfully it sounds like he has now got his priorities straightened out and he will be racing on the weekend after Labor Day in the two day annual regatta at Massapoag YC, home of the FIRST, the LARGEST and the MOST FUN RS Aero regattas in the north-east. I promise there won’t be 200 other RS Aero sailors there so it’s bound to be much more fun than Weymouth. Do come and join us. You can get some tips from an RS Aero World Champion. You can even charter an RS Aero for a very reasonable price if you are not yet an RS Aero owner. Email me at tillermeister@gmail.com if you want more information.